I've been married under two months. I don't think that makes me an expert on marriage by any stretch of the imagination. 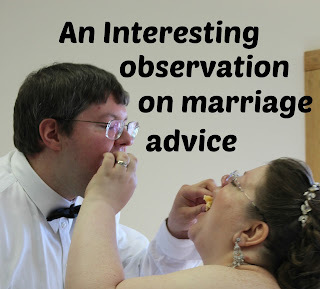 I do, however, want to talk about marriage advice that was given us and give a few suggestions if you are giving advice to newlyweds or those soon to be married. First, I noticed that the longer a person had been married, the more positive their advice tended to be. There is a lady at my church who has been married 56 years. She says all the time "Aim for sixty!" I was a first time bride at age 41. I told her I'd be 101 on my 60th anniversary, and she said, "Aim for it anyway!" She gave other advice, too, that was fun, upbeat and positive. I believe her husband just ribbed my fiance and said, "Just know she's always right." And laughed. You know, that's actually not too bad of advice because I see it as advice to be willing to compromise. I found the longer people had been married, the less the focused on the negative parts of marriage. I'm not sure if it's because the older generation took marriage more seriously, if they have learned to laugh at themselves, or if it's something else. Even when the longer married couples would say something negative, I could tell it was always in jest. When I first met my husband's grandfather, he gave us a stern talking to telling us marriage was for life. He was 99 when I met him, and a few months later, he didn't remember me when I saw him again. As soon as we told him we were engaged he pointed at us and told us, "Now, listen. Marriage is for life." It was so identical that I have a feeling he'd been telling dating couples that since before I was born! Of course, he also asked other questions. Were we getting married in Church? He emphasized faith in our marriage. With everything my husband and I had been through while we were dating, the thought of things being rougher after marriage than during dating was enough to make me want to run. 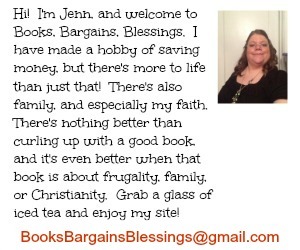 (In fact, one night I actually looked up the requirements to join a convent!) Not every couple is the same, and some go through a lot while dating. My husband and I, while dating dealt with the following: being full time caregivers for my dying mother, my mother dying rather unexpectedly (we knew it was coming, but didn't expect it that soon), blackmail, false police reports, his grandfather passing away, financial issues, a breast cancer scare, eight friends and neighbors passing away. That's just the highlights. (lowlights?). Now, tell me, if marriage is harder than all that in one year, would YOU have ever wanted to get married? I want to become that older couple who holds hands and everything thinks they are cute. I like to think focusing on the positives will help us get there.